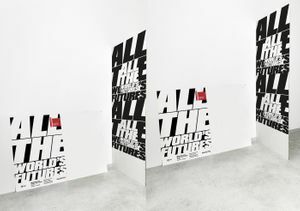 Taking their cue from Okwui Enwezor’s title for the International Art Exhibition at the 56th Biennale di Venezia, All the World’s Futures, Rose and Till present an array of works by artists who are deeply invested in local iterations of power, freedom, and civil liberty. 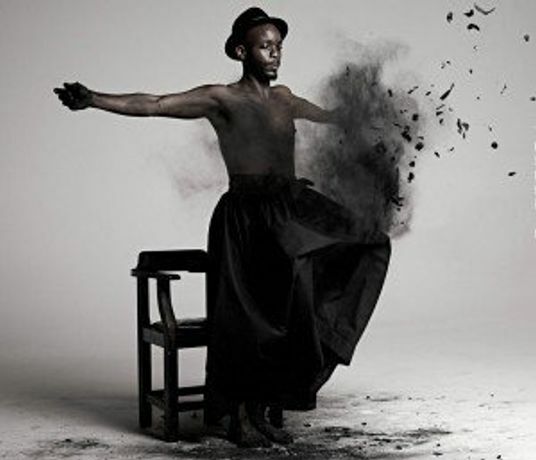 The curators wish not only to represent recent, important work from South Africa, but also to set in motion a complex and dynamic debate about the relationship between the contemporary moment and the narratives of the past. With this in mind, they have sought ways of inserting new works into a series of historic moments without, in any way, making those moments explicit or suggesting a crass opposition to or identification with history. Rather, they see—and seek to represent—the past as an alluvial undertow in South Africa’s fractured and multivocal present, a stream of dreams, desires, and memories that frequently boil to the surface in ways both useful and destructive. The contemporary works on the exhibition pose a series of counter moves. Some are little interested in history and focus instead on ruptures in the present. Some embed themselves in regurgitated narratives of liberation and national identity with the view to unsettling the certainties of these narratives. Some, through their representation of the fraught particularities and singularities of individual lives, interrogate the grand myths of democracy and nation building. Some are subtle meditations on loss or escape or hope; others, strident refusals of the normative. Given the strength of the works to be presented, the curators face the challenge of saying too much or offering too confused an experience of the works and their disparate imperatives. They thus bring to bear on the conceptualising of this exhibition, their combined experience—from work in the public sector, the management of museums and biennales, curatorship, architecture, gallery and museum design—of locating and communicating a strong but multilayered curatorial idea that encourages critical debate and brings fresh insights to our own particular contemporary moment. Jeremy Rose formed Mashabane Rose Associates cc (MRA) in 1996 with Phil Mashabane. Rose has been principal architect on several museum, heritage, and public art projects, including the Mandela Capture Site Museum, the Mandela Cell sculpture, Freedom Park Museum, Nelson Mandela – ‘Prisoner to President’, Paris, Goodman Gallery Cape, the Mandela House Visitors’ Centre, the Hector Pieterson Memorial and Museum, the Apartheid Museum, Liliesleaf Liberation Centre, Rivonia, the Origins Centre Wits University, the Mandela Capture Site public sculpture (with artist Marco Cianfanelli), Moving into Dance, Newtown, the Oprah Winfrey Leadership Academy for Girls, and the University of Johannesburg Arts Centre. MRA was the 26th Sophia Grey Memorial Laureate, was shortlisted for the World Architecture Festival (Barcelona) culture category for Freedom Park Museum, and won commendation from the World Architecture Festival (Barcelona) for the Freedom Park Memorial. MRA won the Institute of South African Architects Award of Merit for Liliesleaf Liberation Centre, the Pretoria Institute of Architects Award of Merit for Freedom Park, the Cube Award for Public Space for the Hector Pieterson Memorial and Museum, the Institute of South African Architects Award of Excellence for the Apartheid Museum and the Grand Prix Loerie Award for the Apartheid Museum. Christopher Till began his career as Director of the National Gallery of Zimbabwe before serving as Director of the Johannesburg Art Gallery from 1983 to 1991. As Director of Culture for the City of Johannesburg, he established the city’s first cultural office and helped with the formation of arts and culture policy. He was responsible for establishing the Johannesburg Biennale in 1985 and the Johannesburg Arts Alive International Festival in 1992, and for the re-building of the Civic Theatre (now Joburg Theatre). He was a seminal roleplayer in the redevelopment of the Newtown Cultural Precinct. He is a founding board member of the International Council of Museums Fine Art Committee and Chairman of the Cape Town Triennial Organising Committee. He is Director of the Apartheid Museum in Johannesburg and the Gold of Africa Museum in Cape Town. Till is currently directing the planning and development of the new Javett Art Gallery and Museum at the University of Pretoria.